I made a critical error and updated some system software before puzzle time. Guess what? The NYT's applet doesn't seem to cooperate with the latest Java, at least not on my Mac. It took a good long while to get that figured out, and the puzzle that never loaded—well, as far as the applet was concerned, it had loaded just fine even though I had a blank space in that window. So disregard that hour-and-14-minutes solving time. Disregard it! It is a lie. I started the puzzle with 1:11:30 on the clock, honest. 20A. [Residential area of California (think Chevy)] clues SUBURBAN MALIBU. The Suburban is one of those behemoths and the Malibu is sportier. Barbie drove a Malibu in the '70s, didn't she? 26A. [Start of a stampede, maybe (think Ford)] is a MUSTANG ESCAPE. Oh, does my son love Mustangs. He's nine. And if he drives a real car the way he drives in a video game, he's never getting a Mustang from his parents. 48A. [Part of a peace treaty (think Honda)] is an ACCORD ELEMENT. Remember when the Element was that funny-looking boxy thing before the Scion xB and that newer, boxier thing came out? Cool theme! Highlights in the rest of the puzzle include the longer phrases SUNDAY BEST and MOBILE HOME; APU ["The Simpsons" storekeeper] in close proximity to his native INDIA ([Locale of many outsourced jobs]); some friendly SEA COWS ([Dugongs or manatees]); REVIVE clued by way of [Bring back, as a fashion]; and the sorta-out-there ROHAN, or [Realm of Tolkien's Middle-earth]. If you didn't read those Lord of the Rings books, that ROHAN was probably fighting you letter by letter—and if you did read 'em, it was a gimme. It's late enough and my computer is giving me a touch of PTSD tonight, so I'll sign off 'til morning. 63A. CHAIN OF EVIDENCE [Paper trail, perhaps]. These are four terrific in-the-language phrases and as for freshness-as-indicated-by-the-Cruciverb-database factor, the first two appear to be making CS debuts and the latter two to be appearing for the first time ever. That's pretty durn fresh in my book. In the non-theme fill there's AMPLE material to keep the solver happy. Or this one, anyway. There're the men's names, each with a double letter: RONNY [Howard on "The Andy Griffith Show"], Greek god APOLLO, ["Manhattan" director] Woody ALLEN, MATT [Lauer of NBC] and TODD [SPAWN creator McFarlane]. Never hearda him; never hearda Spawn. Live and learn. I liked the misleading CLUE [Scratch or dent, e.g.] for FLAW. In other words, we're lookin' for a noun here, and not a verb. And I also liked [Bones in a cage] for RIBS—as in "rib cage," and not the remains of some well-fed animal's meal... Ditto the way, in the grid, NORMS crosses NORMA right there at center. Did you notice the word NOTARY today—and the word FOO? The former sent me in search of the comic-strip phrase notary sojac—which was often written into the newspaper strip "Smokey Stover." I hadn't known that the word FOO (not as it's clued today, of course) was also the creation of "Smokey" artist-and-writer Bill Holman and may appear in the strips more often than the oft-seen notary sojac. Btw—Mr. Holman's hometown? None other than Crawfordsville, IN, hometown of the NYT's Will Shortz! 21A: [Helpless] clues OVER A BARREL. It took me forever to remember that phrase...and the upper right corner was where I finished up, so the crossings hadn't helped me out much. 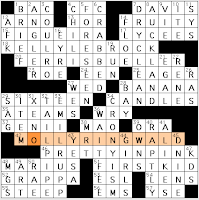 26A: [Something wonderful, in old slang] is THE BEE'S KNEES. I have been known, on occasion, to use this phrase. 43A: ['80s animated character assisted by the seven Color Kids] is RAINBOW BRITE. I'm a hair or two too old to have been into Rainbow Brite as a kid. Wikipedia tells me I was in college then—and that there was a villain named Murky Dismal. Watch for a new line of Rainbow Brite toys to hit stores this fall—and then avoid them, unless there's a Murky Dismal doll. I would pay good money for a Murky Dismal toy. 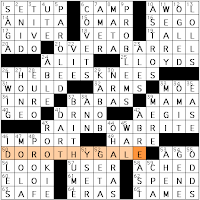 50A: DOROTHY GALE is the [Character who, in a movie released nationally 70 years ago today, sang the ballad formed by the first words of 21-, 26- and 43-Across]. Easy way to remember Dorothy's last name: a gale is a strong wind. I know, I know—now you're going to remember that she's Dorothy Gust. Not the best mnemonic device. Really smooth fill throughout this grid, no? I like the cluing, too. [Like most hoopsters] means TALL. WOULD gets a fill-in-the-blank that's fun to say: ["How much wood ___ a woodchuck chuck..."]. PROOF is a [Smoking gun, e.g. ], and that Smoking Gun website is a good place to find embarrassing mugshots and court papers. Matt Jones's Jonesin' crossword, "King John—goodbye, Mr. Hughes"
This one's a tribute to the late John Hughes and features three of his movies and two of his leading ladies. (No, he didn't write or direct FIRST KID, the [1996 comedy with Sinbad as a Secret Service agent].) KELLY LEBROCK was in Weird Science, which I never saw any reason to see. MOLLY RINGWALD starred in SIXTEEN / CANDLES and two other Hughes movies, including PRETTY IN PINK, a [Film named after a hit Psychedelic Furs song]. And then there's FERRIS BUELLER's Day Off. [Word in Portuguese place names that means "fig tree"] is FIGUEIRA, but I had the O in surname Figueirôa coming to mind and making me unsure of the U in the answer—since that crossed [Prefix meaning "clown," especially used for fear of clowns]. COULRO is the answer, but really, COILRO and COELRO looked about as likely to me. Insanely weird crossing! ["The Vampire Chronicles" character de Romanus]...hmm, is this an ordinary name or a goofy spelling? The two last letters crossed [Particle physicist whose findings were first accepted by Einstein, but were later shown to be fraudulent] and a fill-in-the-blank with ["___ jumpy rhythm makes you feel so fine" (lyric from Johnny Cash's "Get Rhythm")]. Hey, I don't know either! 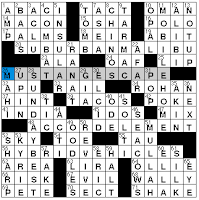 They're EMIL RUPP (not on my short list of people whose first/last name combo are cool to see in a crossword) and "YES, A" crossing MARIUS. Ouch. 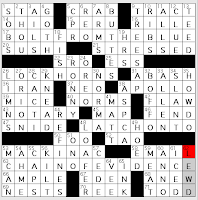 The other five 8-letter answers were all much easier to get than EMIL RUPP.